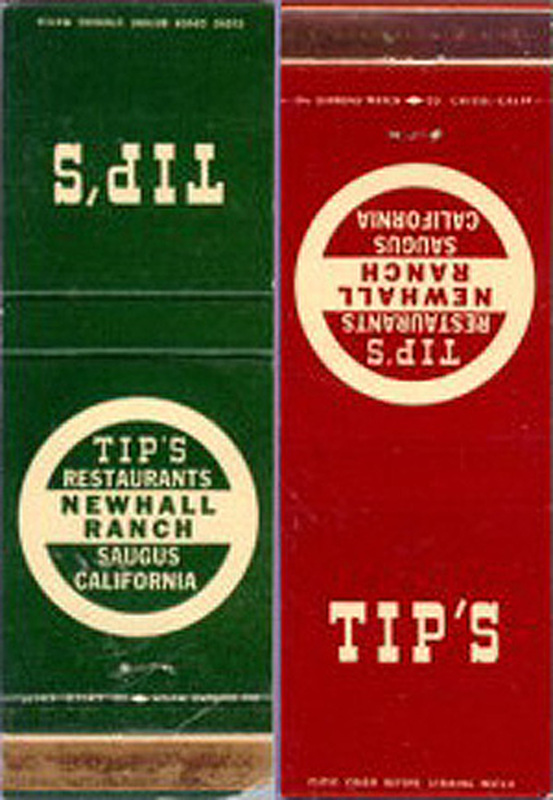 Tip's Restaurant matchbooks, when the diner was located at Castaic Junction (part of the Newhall Ranch, then considered Saugus  before The Newhall Land and Farming Co. had developed Valencia or the planned community of Newhall Ranch). Tip Jardine had been operating a restaurant in Hollywood for more than two decades by the time Atholl McBean, president of The Newhall Land and Farming Co., recruited him in 1947 to open a restaurant at Castaic Junction, where the company's agribusiness was headquartered. Jardine had opened his first restaurant in 1925 and also operated restaurants in Santa Monica and Van Nuys. Tip Jardine's Santa Monica restaurant. Soon to follow Jardine's first SCV location was Tip's Coffee Shop, which operated simultaneously at the northeast corner of The Old Road (as it's called now) and present-day Magic Mountain Parkway. This site would become J's Coffee Shop, and then the building was reconfigured and operated as a Marie Callender Family Restaurant. 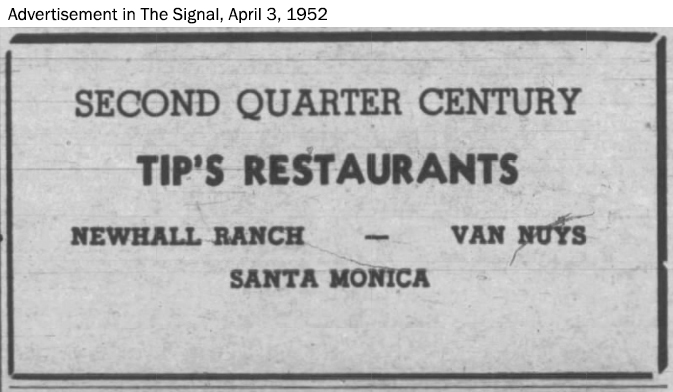 The original Tip's Restaurant at Castaic Junction is where some believe actor James Dean, 24, stopped for a last meal of pie and milk Sept. 30, 1955, just hours before his fatal car crash. The topic remains a matter of dispute. The parking lot between a Texaco gas station and J's Coffee Shop — the former Tip's Coffee Shop — was the site of the 1970 Newhall Incident, in which four young CHP officers were gunned down. It was the worst massacre in CHP history. By that time, Tip's had moved to a new location at the top of Lyons Avenue/Pico Canyon Road in Newhall, immediately west of the Interstate 5 overpass. (The location would later become an International House of Pancakes restaurant.) Ironically, it was across the street from the house where one of the Newhall Incident assailants holed up. 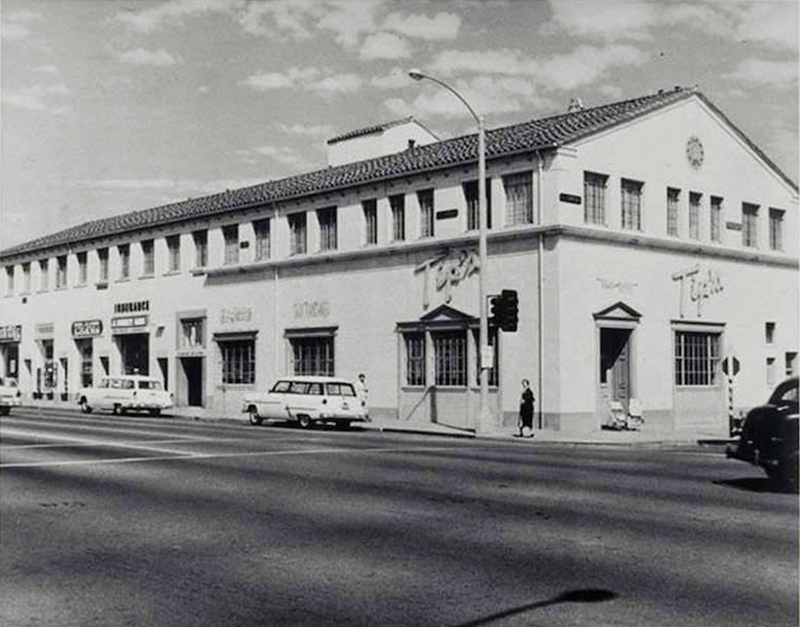 For a while, Tip's simultaneously operated a restaurant on Sierra Highway near the southwest intersection of Via Princessa. It became Beale's Cut and then Cal Islands, which were also fairly short-lived. It was at the Pico Canyon Road location that the world-famous mixologist Bobby Batugo made a name for himself, and for Tip's, with his award-winning alcoholic beverage concoctions. A 1926 emigrant from The Philippines, Batugo came to Hollywood as a bartender and mixed drinks in private clubs — including speakeasys during Prohibition — before Tip Jardine recruited him in 1948. Batugo blended liquor, fruit juices and liqueurs (he was partial to Midori) into unique works of art, elevating mixology to levels not previously seen in the SCV. 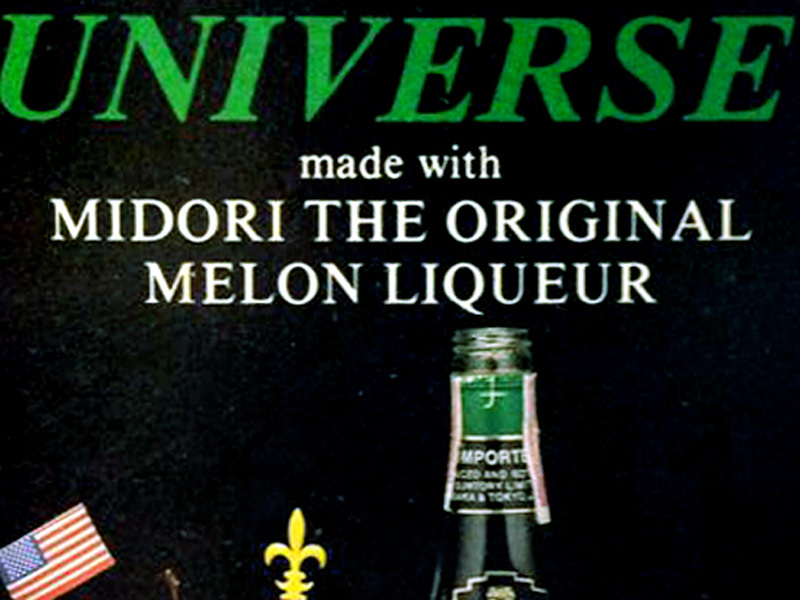 He was the only three-time national champion in United States Bartenders' Guild competition and won the International Cocktail Competition in 1973 with his drink, The Icy Sea, which used gin, rum, Amaretto, grenadine, triple sec and tropical fruit juices. Tip's had a good run. The end came after a brief move to a fifth SCV location in the Plaza Posada shopping center on Lyons Avenue, where the restaurant went out of business in the 1990s. LW2148: 300 dpi jpeg from 100 dpi jpeg.